I’ve been working on a new core and info site for the Laser, Optics and Holography web ring. The purpose of this site is to provide members and possible new members of the ring with information about the ring, requirements and other information. Additionally the page has been modified to support Search Engine Optimization using some plugins for the content management system so hopefully it will show up better in search and then guide people to the different websites in the ring through news and updates. The site will provide additional benefit in allowing LOH WebRing members to post updates and links to their sites as they add new information. That information will be search optimized, and the links in their posts will direct people directly to their website. The page is currently under development, but when it is ready for members to join and post information, I will post that on the site. 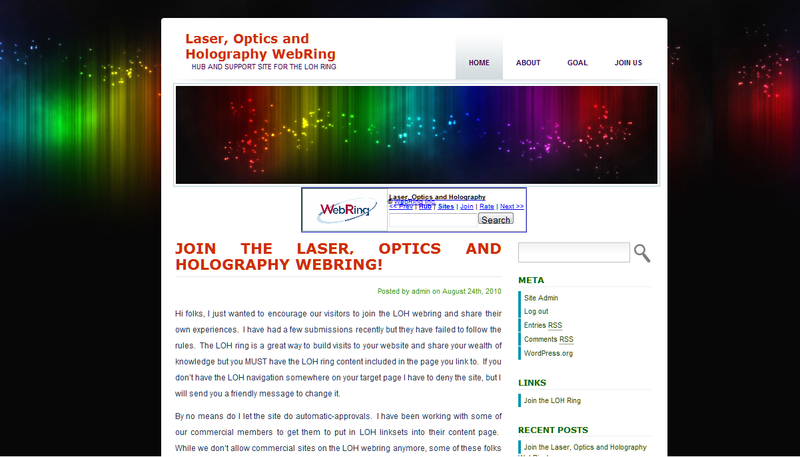 If you know anyone who should be on the WebRing but currently is not or if you would like to join yourself, please send them to this link http://X.webring.com/wrman?ring=nightlase;addsite;invite= which will get them started with setting up their account and/or membership on the WebRing.